Mindful Eating Retreat for Emotional Eating and Binge Eating - Am I Hungry?Am I Hungry? Do you struggle with emotional eating or binge eating? We can help! Retreat with us and together we’ll explore why you eat and show you new skills and strategies to break your binge-repent-repeat cycle. Most important, the Am I Hungry? Mindful Eating Retreat for Emotional Eating and Binge Eating will start you on your journey to the big life you crave! What: 5 day, 4 night retreat. Includes: Mindful eating workshops, small group therapy, mindful eating experiences, and room nights. Click here to download the information packet for retreat details and registration links. Not ready to attend this retreat? Simply provide your email address in the sidebar on the right, and we will email you information about any future retreats. Training: We also offer Am I Hungry? 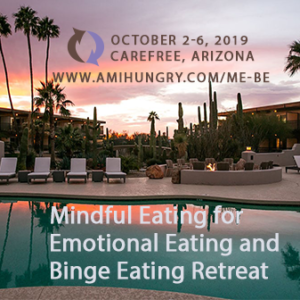 Mindful Eating for Binge Eating Training for therapists and treatment teams at this retreat and online. Learn more. You may also be interested in our other mindful eating retreats! Do you binge eat? Take this quiz. Worried about privacy? Read Shhh! We Have a Secret! Concerned about cost? Read Cheap Sunglasses. Future Retreats: If you would like to be notified about our upcoming retreats, please fill out the form in the sidebar. I was totally engaged from the moment I arrived. The format, pacing, activities, setting-everything supported and facilitated transferring a huge chunk of information to us while fostering a sense of intimacy, compassion, and opportunity for participants to make real connections with each other. And you and Kari were so great, so accessible and real…what a wonderful experience. I’m still glowing! LOVED IT!!! Loved it, loved it, loved it! I came with an open mind – I leave with a mind filled with skills to build a fuller life. This program was new, exciting and is a vehicle to a new life – a BIG life – one without binge eating! This concept is so simple and common sense, and does not contain any of the diet rules we’ve lived with all our lives. This will be your last non-diet! Separating from food when it’s your best friend is painful. Knowing how to live a healthy life without food needs guidance, love, knowledge, support and a passion for making sure each person moves to other new place of growth. This ME-BE program is masterfully and lovingly created to move you through the process of saying goodbye to bingeing and hello to living!